Notice to Metlakatla Band Members: There has recently been an increase in biotoxin contamination found in Metlakatla's clam/cockle beaches. METLAKATLA BC - The Metlakatla First Nation is offering a $1,000 reward for information that leads to the arrest of the person(s) responsible for a fire in the Metlakatla Ferry Dock parking lot in the early morning hours of February 25. 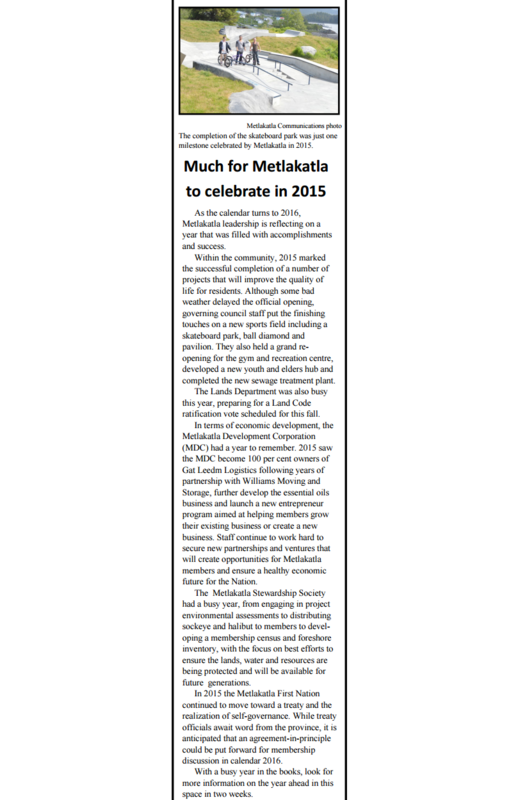 Much for Metlakatla to celebrate in 2015! Here is a look back at some of the accomplishments of 2015, published in Wednesday's issue of the Northern View. Look for more regular updates in the coming weeks!